Long, long ago, there lived three friends in a jungle. They were-a deer, a crow and a mouse. They used to share their meals together. One day, a turtle came to them and said, "I also want to join your company and become your friend. I'm all alone. " "You're most welcome," said the crow. "But what about your personal safety. There are many hunters around. They visit this jungle regularly. Suppose, a hunter comes, how will you save yourself?" No sooner had they talked about it than a hunter appeared on the scene. Seeing the hunter, the deer darted away; the crow flew in the sky and the mouse ran into a hole. The turtle tried to crawl away fast, but he was caught by the hunter. The hunter tied him up in the net. He was sad to lose the deer. But he thought, it was better to feast on the turtle rather than to go hungry. 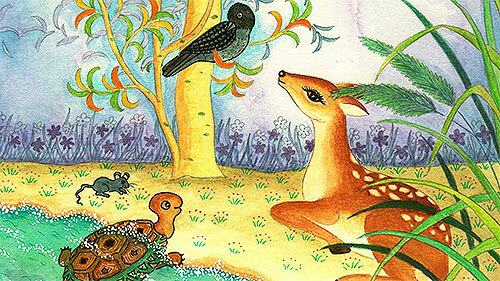 The turtle's three friends became much worried to see his friend trapped by the hunter. They sat together to think of some plan to free his friend from the hunter's snare. The crow then flew high up in the sky and spotted the hunter walking along the river bank. As per the plan the deer ran ahead of the hunter unnoticed and lay on the hunter's path as if dead. The hunter saw the deer from a distance, lying on the ground. He was very happy to have found it again. "Now I'll have a good feast on it and sell its beautiful skin in the market," thought the hunter to himself. He put down the turtle on to the ground and ran to pick up the deer. In the meantime, as planned, the rat gnawed through the net and freed the turtle. The turtle hurriedly crawled away into the river water. Unaware of the plot of these friends, the hunter went to fetch the dear for its tasty flesh and beautiful skin. But, what he saw with his mouth agape was that, when he reached near, the deer suddenly sprang up to its feet and darted away in the jungle. Before he could understand anything, the deer had disappeared. Dejected, the hunter turned back to collect the turtle he had left behind on the ground in the snare. But he was shocked to see the snare lying nibbled at and the turtle missing. For a moment, the hunter thought that he was dreaming. But the damaged snare lying on the ground was proof enough to confirm that he was very much awake and he was compelled to believe that some miracle had taken place. The hunter got frightened on account of these happenings and ran out of the jungle. The four friends once again started living happily.